Narrative: Firefighters helped extinguish a small smoldering tree fire. Occupants were using a propane torch to kills weeds, and they hadn't noticed the fire had spread from the ground cover to the tree. Address: S 64th/Tacoma Mall Blvd. Narrative: Firefighters responded to a reported brush fire. Upon investigation, they found an approximately 200 x 50 foot fire burning in a heavily wooded area. Crews were able to establish a "wet perimeter" to contain the fire and then extinguished it. The cause of the fire was undetermined. Address: 404 N "D" St. Narrative: Responded for an automatic fire alarm, and upon arrival determined that the occupants had burned food on the stove top. Narrative: Firefighters used tank water and a booster line to extinguish small grass fire in a vacant lot. Address: E. 38th St/E. 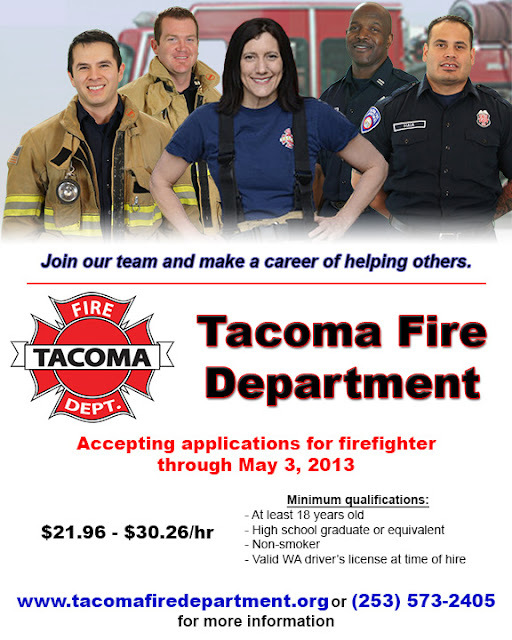 Howe St.
Just a reminder that if you or someone you know is interested in a career with the Tacoma Fire Department we are currently accepting applications. The deadline for submitting your application is May 3, 2013 at 5:00 p.m. Address: 7444 S. Bell St. Narrative: Firefighters responded to a reported car fire. The cause of the fire appeared suspicious, and the incident was referred to Tacoma Police Department for follow-up. Address: 2100 N Pearl St. Narrative: Firefighters responded to a fire in a discarded couch that was left outside. Address: 152 S. 45th St. Narrative: Firefighters responded a reported house fire. See original post here. Narrative: At 11:11 a.m. firefighters from stations 1,2,3,8,12, and 17 responded to a reported house fire. The first arriving company found heavy smoke showing from the side and rear of the one-story 1,058 square foot house. Crews attacked the fire with handlines, ventilated the structure and completed a search to confirm no one was trapped in the building. Two of the occupants were evaluated by paramedics and released at the scene, and a total of five were displaced by the blaze. A fire investigator determined that a mechanical failure in a dishwasher started the fire, resulting in an estimated $81,500 damage to the building and its contents. Effective April 2013, Ordinance No. 28142 amends Section 4.10.130 of the Tacoma Municipal Code to establish no-wake zones in the Thea Foss Waterway and within 1,000 feet of any marine fueling dock. These changes to the Harbor code are designed to improve public safety and reduce spillage at marine fueling docks. 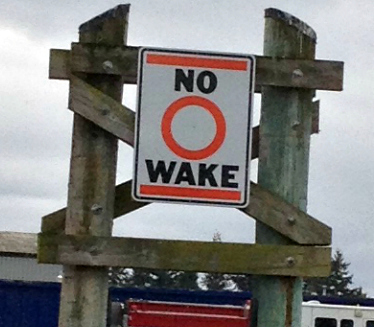 *The fueling docks located at the Foss Harbor Marina and Youth Marine Center is included within the Foss Waterway NO-WAKE Zone. Address: 3017 S. Washington St. Narrative: Firefighters responded to a reported kitchen fire. Upon investigation crews determined that the occupants had left a pan on the stove. The contents of the pan caught fire and charred upper shelves, their contents and filled the house with smoke. Crews removed the smoke and confirmed that there was no fire extension.